Home > Why SMS > Why All Girls? 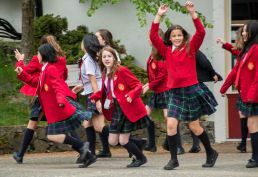 “Girls’ schools create a culture of achievement where a girl’s accomplishments are what matters,” explains the National Coalition of Girls’ Schools in a summary of its recent survey of young alumnae from SMS and other member schools. Years of research confirm that point. For more on the benefits of girls’ schools, please visit the website of the National Coalition of Girls’ Schools. SMS is located in a beautiful setting: a green and peaceful 22-acre campus that is just 15 minutes from downtown Victoria, yet seems a world away. What grade level are you interested in for your daughter?